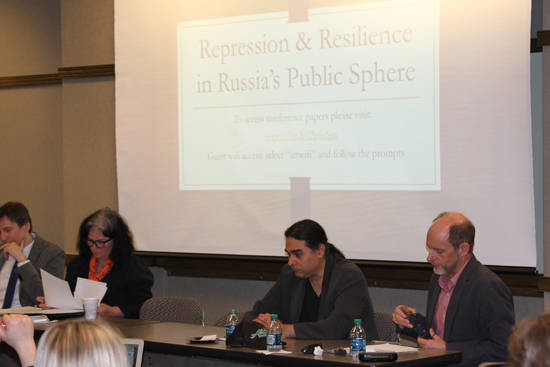 Features editor at Meduza.io, a leading Russian independent digital news outlet, Gorbachev was among the journalists and scholars discussing “Repression & Resilience in Russia’s Public Sphere,” April 13 and 14 at the Indiana Memorial Union. The conference was the first convened by the Russian Studies Workshop, a program funded by a million dollar grant from the Carnegie Corporation of New York to reinvigorate contemporary Russian studies and train the next generation of Russia experts for careers in government, business, academia, and the non-profit sector. The RSW is based in the Russian and East European Institute at the IU School of Global and International Studies. By way of antidote to what Gorbachev called the “oversimplified” portrait of contemporary Russian media that has circulated since the 2016 presidential election, the journalist and his fellow panelists provided balance, history, and nuance over the course of the conference’s five panel discussions. Along with Gorbachev, participants included three other independent Russian journalists, two US-based Russian media scholars, veteran reporters teaching at IU’s Media School, and scholars of political science, Russian studies, sociology, and other fields affiliated with the College of Arts and Sciences and SGIS. The subtlety required in describing the contemporary media landscape in Russia emerged over the course of discussions considering the Kremlin’s response to social media, the distinction between passive surveillance and active censorship, and the similarly tenuous state of American journalism, thrown into relief by the 2016 election. While independent Russian media outlets have been struggling in the wake of increasing governmental control, it bears acknowledging that American mainstream media is at the same time suffering “an existential crisis,” according to Sarah Oates, Professor and Senior Scholar at the Merrill School of Journalism at the University of Maryland. A wholesale lack of trust among the public, a sense of mission drift within journalism pedagogy, and the reluctance among social media platforms to acknowledge their role as primary distributors of information were just some of the challenges confronting American media that Oates noted. At the conference, Fishman and his peers shared their resourceful survival strategies. When the government disconnected the independent television channel "TV Rain” in 2014--explained Fishman, a presenter for the channel--TV Rain resuscitated itself on the internet, relying on its readers for support by erecting a paywall. Gorbachev explained how Meduza.io eluded government control by moving its headquarters to Latvia. Journalist, publisher, and activist Sergey Parkhomenko introduced the term “ad-hoc journalism," suggesting that some of the best independent media alternatives in Russia today might include the websites of NGOs and other civic organizations. As one discussion concluded, Lipman asked the journalists and media scholars to reprise their understanding of the role of journalism. Regardless of shifting tides in both countries, the responses from both Russian and American panelists harked back to traditional journalistic principles. “To try to keep government secret services transparent,” offered Russian investigative journalist Andrei Soldatov. “To empower citizens with information,” asserted Oates. “To provide the link between cause and effect,” suggested Diana Sokolova, PhD candidate at the Media School. “To structure reality into a coherent narrative that makes sense of the world,” proposed Gorbachev. 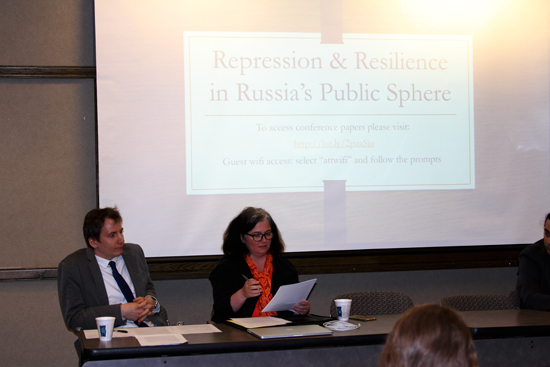 “Repression & Resilience in Russia’s Public Sphere” was sponsored by the Russian Studies Workshop, with support from the Carnegie Corporation of New York. Co-sponsors included the Media School, the School of Global and International Studies, and the Russian and East European Institute. Support also came from the College Arts and Humanities Institute.